Double Dutch is a new range of premium soft drinks created by Dutch Twins, Raissa and Joyce de Haas. The drinks, which are all natural, low calorie mixers, have unique and exciting flavor combinations, such as Watermelon & Cucumber and Pomegranate & Basil. growing range of premium spirits, was realised when they produced their first batch in February. I was lucky enough to be invited to the Double Dutch launch at Aubaine in Selfridges, where I tried their delicious mixers for the first time. The Pomegranate & Basil works fantastically well with both vodka and gin, either as part of a cocktail, or as a simple mixer. It's dry and fruity, intense yet light. The Cucumber & Watermelon is fantastically thirst-quenching, with an incredible balance of flavour. I'd have this over normal tonic with my vodka any day. 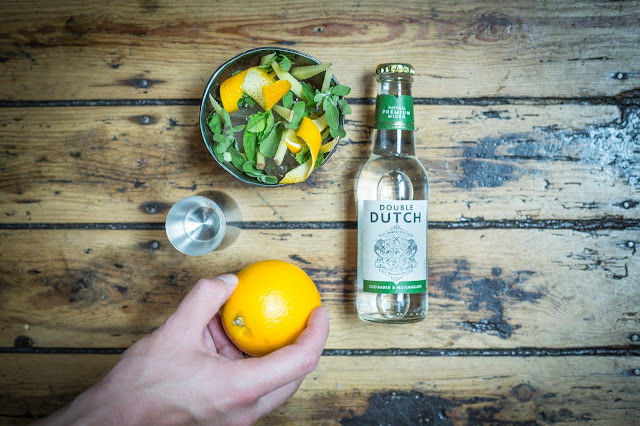 Stocked in Fortnum & Masons, Harvey Nichols and a whole host of online retailers, Double Dutch drinks are easy to enjoy at home, for just £1.25. As well as Aubaine restaurants, you can find Double Dutch in venues such as The London Cocktail Club group, Hutong in the Shard, ACE Hotel, Sketch and the Goring Hotel. So what's next for this bright young startup? Well, there are plans to launch a drink early next year, designed around the theme of spring. Lavender and ginger flavours have been mentioned for the next premium mixer, which will be specifically designed to drink with rum. Watch this space!